Energetic, hilarious, genuine, and heart-warming show! Headlining the 2019 Dayton Celtic Festival! Meet the Fitzgeralds --- a family group consisting of fiddling and step dancing sensations - Tom, Kerry & Julie Fitzgerald (the youngest members of Everything Fitz). These siblings, from Canada’s renowned Ottawa Valley, have come a long way from their small town roots. 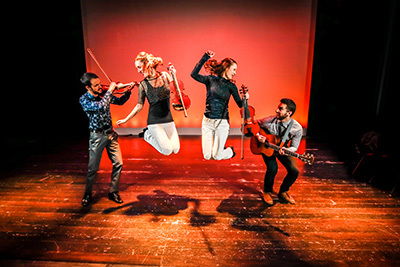 Featuring 3-time Canadian Grandmaster Fiddle Champions and Ontario Open Step Dance Champions, this unique act features high-energy fiddling and mind-blowing step dancing. It is the rare combination of exceptional musicianship, incomparable step dancing, audience interaction, evident love of performing, and genuine sibling connection that resonates with audiences of all ages and sets this group apart. Do not miss The Fitzgeralds at this years Dayton Celtic Festival!